We had a very hectic week last week and by Sunday I was feeling pretty shattered. Thankfully though, we’d arranged with our friend Norma, to visit her in her home in Angus for a couple of days to relax and get away from work and the studios. The plan was to drive up to Angus on Sunday afternoon after first collecting our work from Eglinton Park at the end of the North Ayrshire Open Exhibition. Work could be collected anytime after mid day and so we got there almost as the doors opened ….and I had a very nice surprise ….the larger of the two paintings I had exhibited in the exhibition, had sold on the last day! Wonderful. It was a real boost after what has been a lean time recently. Anyway, the painting was bought by a couple who had visited my studio six months or so ago …so….if you’re reading this …a big thank you and I hope you enjoy the painting. This great bit of news certainly woke me up and made for an enjoyable journey up to Norma’s where we celebrated with a couple of bottles of beer. Another friend, Lorraine, also joined us and the following morning we drove the few miles up to Glen Clova for what Norma had assured us would be a good walk. 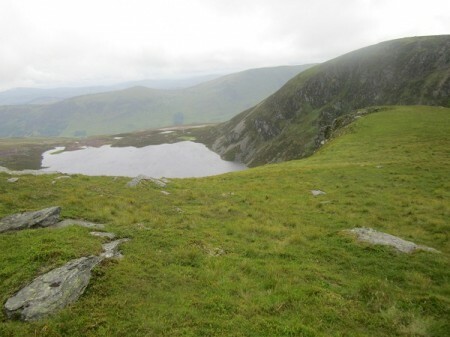 Her plan was, to follow the path behind the Clova Hotel and up to the hidden little Loch Brandy. This nestles in a small but dramatic and craggy little corrie, but one which can’t be seen from the road in the glen below. It certainly wasn’t going to be a fine day with the clouds dark and heavy and the rain at times persistent. We all though needed a walk whatever the weather and so we donned the waterproofs and set off up the track. The Angus hills really are lovely. The glens are steep sided but with the tops rounded and grass covered they make for easy walking once the height is gained. As I say, Loch Brandy is tucked away and you don’t get to see it until the last minute. Then, suddenly, there it is with the steep craggy corrie rising all around. In fine weather it must be stunning, but in this gloomy weather it had quite a wild and lonely look about it. The path climbs steeply up and then easy grass slopes lead all around the corrie edge before descending once again to the loch side. We were lucky and the whole time we were walking, the cloud stayed away giving dramatic views across the loch and hills beyond. Not a day for stopping and sketching but this could certainly be a place to do a painting at some point in the future. 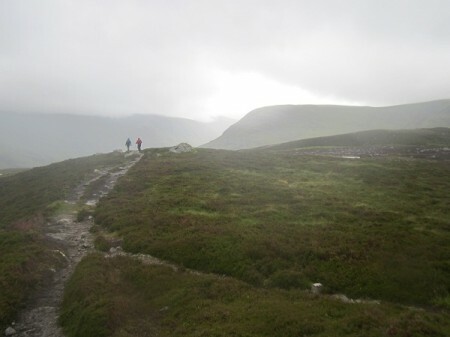 The walk finishes back at the Clova Hotel …so a good excuse for a meal to finish off with. Norma was right ….an excellent walk and an excellent hotel at the end. Another fantastic day on the hills.